The introduction of household piped water in the mid-nineteenth century was the key technological development that cemented the two sides of the urban water cycle— water supply and wastewater disposal. Unfortunately, although piped water supply systems gave urban dwellers more convenient access to water, people were also held hostage to the water supply source chosen by the local water company. For many city dwellers, drinking piped water became hazardous to one's health, as massive epidemics of waterborne diseases, such as cholera and typhoid fever, broke out in many cities in Great Britain and the United States (Table 2-1). Dr. John Snow, physician to England's Queen Victoria, was one of the first to scientifically link waterborne diseases to contaminated source water supplies. Examining records of some 14,600 Londoners who had died in an 1854 cholera epidemic, Snow found that people who had received water from an intake downstream of London's sewage outlets in the lower Thames River had a much higher death rate (8.5 times higher) than those receiving Thames River water from an intake upstream of the sewage discharges (Snow, 1936). The threat of contaminated water sources did little, however, to quell the construction boom of new water supply systems in the second half of the nineteenth century, especially in the United States. In 1850, there were about 83 water systems in the United States. By 1870, the count had risen to 243 systems (Fuhrman, 1984). Like Londoners, American city dwellers with piped water faced an increased risk of waterborne diseases. Beginning in 1805, the New York City Council had the authority and responsibility for sanitary conditions in the city. Despite this early recognition of governmental responsibility for public health, epidemics of typhoid fever broke out in 1819, 1822, 1823, and 1832. Cholera ravaged workers on the Erie Canal (Rowland and Heid, 1976). Between 1832 and 1896, cities in North America and Europe suffered four devastating outbreaks of cholera that were spread by polluted urban water supply systems (Garrett, 1994). Cholera epidemics in New York City in 1832 and 1849 claimed 3,500 and 5,000 lives, respectively. In 1891, typhoid fever caused the deaths of 2,000 people in Chicago (Fair et al., 1971). Hundreds more succumbed to typhoid in Atlanta and Pittsburgh in the 20-year period between 1890 and 1910 (Bulloch, 1989). The importance of an unpolluted source water for public drinking water was clearly shown in the earliest public health studies of waterborne diseases and drinking water supplies. 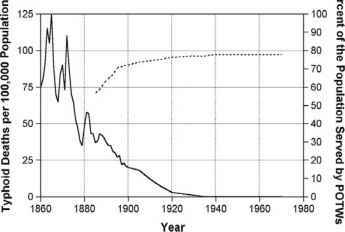 Typhoid death rates in 61 cities of the United States during 1902-1906, for example, ranged from a high of 120 per 100,000 for a run-of-river supply for Pittsburgh, Pennsylvania, to a low of 15 per 100,000 for the upland watershed supply of New York City (Okun, 1996). Source: Adapted from Metcalf and Eddy, 1991.
munities that adopted chlorination. Detailed mortality records and public water supply records compiled by the Commonwealth of Massachusetts, for example, clearly illustrate the link between the introduction of filtration and disinfection of public water supplies and the sharp reduction in typhoid fever deaths (Figure 2-1) from a peak of 125 per 100,000 in 1860 to less than 5 per 100,000 by 1920 and essentially zero from 1940 to the present time (Fair et al., 1971; Higgins, 1998; USCB, 1975). Figure 2-1 Comparison of the death rate due to typhoid and the percentage of population served by public water suppliers in Massachusetts from 1860 to 1970. 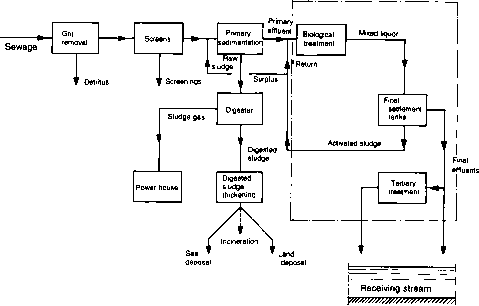 Source: Elements of water supply and wastewater disposal, G. M. Fair, J. C. Geyer, and D. A. Okun, Copyright © 1971, Reprinted by permission of John Wiley & Sons, Inc.; USCB, 1975. Dickens, Chadwick's (1842) Report on the Sanitary Condition of the Labouring Population of Great Britain marked the beginning of the "Great Sanitary Awakening" (Okun, 1996). Chadwick's report directly influenced passage of Great Britain's Public Health Act of 1848 and its formation of the General Board of Health, and, in the United States, the creation of the Massachusetts State Board of Health in 1869 (Okun, 1996) and the New York State Board of Health in 1880 (Rowland and Heid, 1976). The technological impacts of the "Great Sanitary Awakening" on the origins of drinking water treatment and water pollution control systems are well documented in the records of a series of international sanitary conferences held from 1851 through 1938. The conferences addressed scientific issues related to public health, the environment, and the need to control diseases spread by contaminated food and water. The conferences highlighted serious public health and environmental issues that have since evolved as the foundation of the numerous state, local, federal, and international environmental laws and programs enacted in the latter half of the twentieth century (Howard Jones, 1975).